Game Recap: Mets 5, Yankees 1, home runs and pitching get it done | We Gotta Believe! The Mets (84-63) defeated the Yankees (80-66) by the score of 5-1. Steven Matz, after a rocky start, was able to fight through and hold the Yankees to 1 run over 6 innings. The Mets got two home runs off of Masahiro Tanaka in 6 innings, solo shots by Duda and Murphy, and opened their lead with a Juan Uribe 2-run home run and a run-scoring wild pitch after a Daniel Murphy triple. Reliever Tyler Clippard was unavailable for tonight’s game, but Hansel Robles and Addison Reed filled in more than admirably. Clippard’s back tightened up on him and was held out of the game as a precautionary measure, but it appears he will be ready to go tomorrow. Matz got off to a rough start, allowing a leadoff walk to Brett Gardner after getting ahead of him 1-2. He got Chase Headley to fly out and allowed a weak single to Carlos Beltran, advancing Gardner to 3rd. Gardner scored on a sacrifice fly to center, giving the Yankees an early 1-0 lead. Matz worked around another single by Greg Bird to limit the damage. Matz struggled through another inning, but kept the Yankees off the board in the 2nd, working around 2 singles with help from an aggressive play on a bunt by Travis d’Arnaud and a fantastic stretch by Wilmer Flores to get the force. After Masahiro Tanaka set the Mets aside easily in the first, he continued to do so for much of his 6 innings on the mound. His two major mistakes were home runs to Lucas Duda in the 2nd and Daniel Murphy in the 6th, to give the Mets a 2-1 lead. Matz, on the other hand, settled down and was very effective through his next four innings, only allowing 3 base runners. Though only with 82 pitches, the Yankees pinch hit Jacoby Ellsbury for Masahiro Tanaka to lead off the top of the 7th inning. Girardi’s choice did not pan out, as Mets reliever Hansel Robles looked unhittable tonight with his fastball working well. The Mets tacked on in the bottom of the 7th with a 2-out pinch hit 2-run home run by Juan Uribe against lefty Chasen Shreve, a ball Uribe lined just over the wall in right field. Addison Reed looked just as unhittable as Robles, if not more, getting Batters to swing late on his deceptive fastball (even though his fastball only topped out at 93-94 MPH). 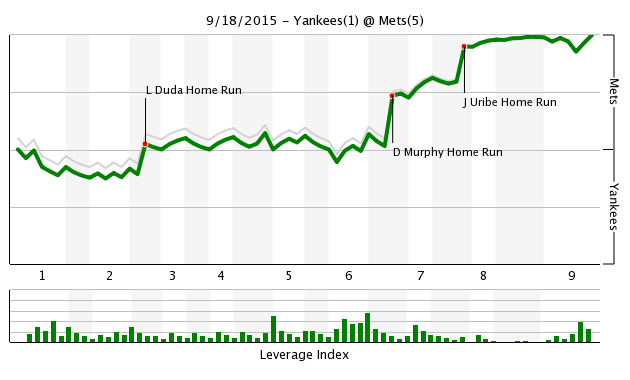 The Mets would tack on another run in the bottom of the 8th after a Daniel Murphy triple off the glove of defensive replacement Jacoby Ellsbury and a wild pitch, scoring pinch runner Eric Young Jr. In the 9th, Jeurys Familia was shaky but effective. He allowed a leadoff double to pinch hitter Dustin Ackley, and after getting Didi Gregorius to ground out, walked pinch hitter Alex Rodriguez and allowed a line-drive single for Jacoby Ellsbury off his knee. Familia would not need to come out of the game, and retired Brett Gardner and struck out Chase Headley to end the game. The atmosphere at Citi Field tonight was absolutely electric. 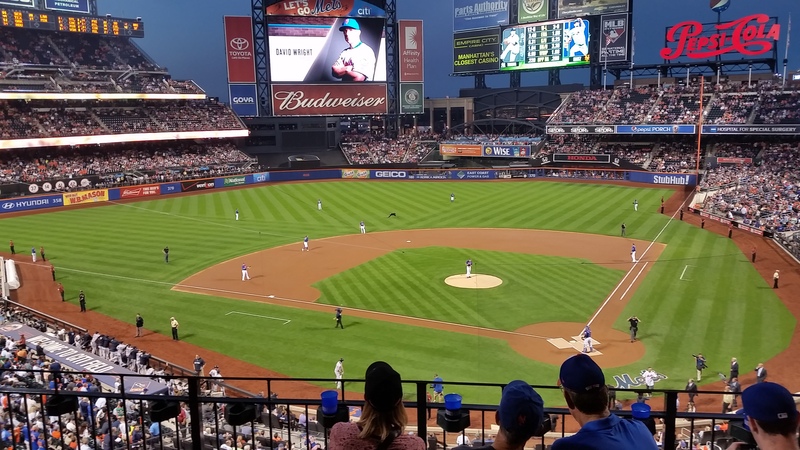 Nothing compared to the game I went to on July 31st against the Nationals, in which Wilmer Flores hit a walk-off home run in the 12th, but it was an incredible atmosphere nonetheless. From my perspective in the seats just in front of the press box, Matz looked shaky but strong, while Hansel Robles and Addison Reed continue to impress. The pair of them looked absolutely unhittable tonight, and Reed’s ability to make batters look silly on 92 MPH fastballs still baffles me. This game had everything though. A fantastic pitcher’s duel, great shows of power, and just enough drama to keep things interesting all the way. Masahiro Tanaka looked absolutely dominant tonight, but as was the case last week with Stephen Strasburg, the Mets were able to hit a couple of key home runs off of him. With the win combined with the Nationals’ 5-4 victory in 10 innings against the Marlins, the Mets maintain a lead of 8 games. With 15 to play, the Mets’ magic number is now 8. The Mets and Yankees continue their series tomorrow at 1:05, with Noah Syndergaard facing off against Michael Pineda.